Today, when you order "10 O'Clock Hour Scott Alexander, DVD", you'll instantly be emailed a Penguin Magic gift certificate. You can spend it on anything you like at Penguin, just like cash. Just complete your order as normal, and within seconds you'll get an email with your gift certificate. Order in the next 3 hours 49 minutes and it will ship TODAY! 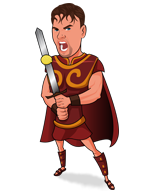 Scott has taken an ancient bar bet and turned it into a closer. You'll learn professional grade choreography, presentation and the absolute best methods for handling whiskey filled shot glasses. Unique, funny and astounding. How many color changing silk routines have you witnessed that make any sense. Only one...Billy McCombs fabulous half-dyed silk routine. Now there are two. Scott's routine is extremely easy with a blockbuster climax. Good for close up, parlor or stage. This one's a workers dream. Now that the universe is "No Smoking" the Cigarette In Coat classic is obsolete. This is Scott's practical solution. Brilliantly framed and yet other surprise finish. Easily worth the price of the DVD. Wow, a close up matrix style routine with kids jacks...jumping jacks! They do everything from transform to translocate in eye-popping new ways. Scott has developed a logical and extremely easy to do masterpiece that no longer requires coins! This is a performance piece right out of Scott's comedy mental cruise ship act. It plays big or small, no problem. It's wacky, zany and right from Home Depot! If you do walk-a-round magic for money this routine will instantly go into your repertoire. It's Scott's terrific handling of the classic Card Stab. It's easy to do, but impossible to figure out. Scott Alexander is a guy I've never heard off until a friend of mine Jim Spinnato turned me on to him. I've gotta say, I'm hooked. The 10 O'Clock show is loaded with some great material. There's a mix of close-up and parlor magic on here. His effect, Sense of Color, is one of the most beautiful routines I've seen. It's a visually amazing color changing silk routine with an unbelievable kicker at the end. I'd have to say that Nailed is my favorite piece. It's basically Tim the Tool Man meets mentalism, and it turns a simple card trick into a full on stage production. He's got effects on here using Jacks (the old ball and jacks game from when you were a kid). There are several incredible utility moves. In fact, a move from Jumping Jacks helped me work out the kinks on a move I was developing. Scott's handling of Cigarette in Coat with matches instead of cigarettes is a killer. The list goes on and on and on. Trust me on this guys (and gals) this one is a GEM! Get it! I personally enjoy Scott Alexander and his performance style. I enjoy how he looks at magic and the twist and additions he gives to classic plots. The 10 O’clock show is filled with great useable material. Below I will go through each effect so that you can get a feel for the DVD. A shot glass disappears and reappears under a hat several times and the routine concludes with the production of a double shot glass. This seems like a fun routine and Scott gives the some helpful and interesting methods for the production of liquid. A great routine. This is Scott’s take on the classic color-changing silk effect. He says that he created this as his personality couldn’t fit the classic Billy McComb routine. Scott explains everything you need to know for this routine. He builds all the gimmicks in the studio and teaching you how to make the silk fountain for the effect. To answer your question, yes you can use it close up as Scott has. This is Scott’s take on the classic and now near politically incorrect “Cigarette in Coat”. Scott has made this effect into a full routine with a production of a glass of liquid from the volunteers coat to end the routine. This one is a crowd please and having used this in performance I can say Scott’s tips breathe new life into this classic! I loved this routine! For playing card jacks turn into actual jacks, then Scott does a matrix with them. To wrap up the routine, Scott has actually found a justified and realistic use for the Bounce No Bounce Balls. It’s not brain-melting magic but it does make for a fun routine. Take one part Las Vegas Showman + a Tool Belt + a Deck of Cards and you get this fantastic routine. The cards are fairly mixed, placed into their box and nailed to a board. The volunteers tear off cards and the mentalist or tool man is able to know what cards they have selected. This is great and one of my favorites on the DVD. This is a great parlor effect, I love it. A napkin and fork are borrowed, and a card is selected and lost in the deck. After the deck is wrapped in the napkin the fork is thrust through the napkin and the deck and in the tines of the fork is their selected card. This effect is impromptu, uses a little sleight of hand, and has great visual impact. This is a good forking trick! You show the audience your short story which is written on some blank playing cards. The volunteer, and in this case, fellow writer names any four-letter word, and that same word is the same word that ends your short story. This close-up effect is designed to be done when the performer is seated. It looks clean and is different than a pick a card effect. The title of the DVD would suggest you will see a full evening show. All though you receive a full show worth of routines you do not get to see Scott perform a full show. The DVD is set up in effect, explanation, effect, explanation format. Personally, I enjoy seeing Scott perform and this lack of show from the 10 O’clock show was a small let down. The routines presented are shot in the studio; however, some would have benefited from live performance. I really enjoyed this DVD. Its mix of Close-up, stand-up, and stage material was great and should have something for everyone. 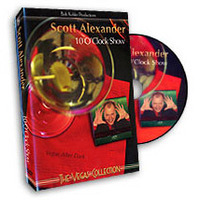 All though Scott’s performance style may not match your own (it shouldn’t) I believe this DVD would benefit most magicians. So check out the 10 O’clock show, or don’t, the choice is yours. A napkin and fork are borrowed, and a card is selected and lost in the deck. After the deck is wrapped in the napkin the fork is thrust through the napkin and the deck and in the tines of the fork is their selected card. This effect is impromptu, uses little sleight of hand, and has great visual impact. This is a good forking trick! The routines presented are shot in studio; however, some would have benefited from live performance. One of the best DVDs ever. Highly recommended. Good material, good instruction. Scott is a true pro. I've seen Scott perform his act in person. I've also attended his live lectures. Everyone will benefit from watching this DVD. Scott offers well-developed professional routines that pack a large wallop.